No XIII Squadron was formed at Gosport on 10 January 1915, taking its BE2Cs across the Channel in October, initially employed on corps reconnaissance duties. No. XIII Squadron lays claim to pioneering bombing in formation when, during a raid on Achiet-le-Grand in November 1916, nine of the Squadron’s aircraft bombed German anti-aircraft defences. In April 1917, RE8s replaced the BE2s and these played a major role in the battles of Arras and Cambrai during that year. When hostilities ceased, the Squadron remained in France, before returning to the UK in 1919 and disbanding. Reformed at Kenley in April 1924, the Squadron resumed its army co-operation role with Bristol Fighters and played a major role in developing co-operation between land and air forces. Atlas’, Audaxes and Hectors were subsequently used, before Lysanders arrived in 1939. As part of the BEF in France during the early part of World War II, No. XIII Squadron carried out tactical reconnaissance missions, before returning, a much depleted force in May 1940. The following year was spent on anti-submarine and anti-invasion patrols before Blenheims arrived and the Squadron returned to army co-operation duties. During 1942, the Squadron provided diversionary attacks for the 1,000 bomber raids, and on one occasion even contributing to the main force itself. By the end of the year, the No. 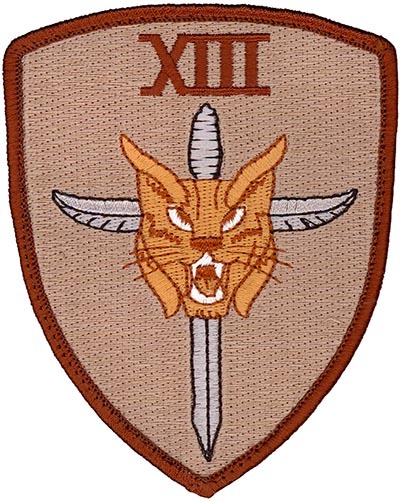 XIII Squadron had moved to North Africa, supporting the First Army throughout its victorious campaign. During the allied invasion of Italy, the Squadron was tasked with shipping protection, and claims to have destroyed one submarine during these missions. After the War, the Squadron was disbanded briefly before reforming in Palestine with reconnaissance Mosquitos. In 1952, Meteors arrived, and later moved to Akrotiri, Cyprus. In 1957, the Squadron began a long association with Canberras and moved to Malta in 1965. As the RAF withdrew from its Middle East bases in the late 1960s, XIII remained in Malta until transferring to Wyton in 1978, continuing to fly Canberras until disbanded in 1982. No. 13 squadron reformed with the new Tornado GR1A at Honington on 1 January 1990, and moved to its current home, Marham, some four years later. On Friday 13th May 2011, XIII Squadron paraded at RAF Marham for the final time prior to their official disbandment on 1 June 2011. The Squadron reformed on 26 October 2012 at RAF Waddington, as the second UK Reaper MQ-9 Squadron. XIII Squadron crews are the first to fly the advanced armed reconnaissance RPAS directly from the United Kingdom. Battle Honors. Western Front 1915-1918, Somme 1916, Arras, Cambrai 1917, Somme 1918, Hindenburg Line, France and Low Countries 1939-1940, Dieppe, North Africa 1942-1943, Mediterranean 1943, Italy 1944-1945, Gustav Line, Gothic Line, Gulf 1991. Emblem. Approved in Feb 1937. Motto: ADJUVAMUS TUENDO – WE ASSIST BY WATCHING.